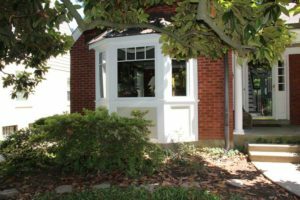 Need to update your bay window? Here’s an idea! 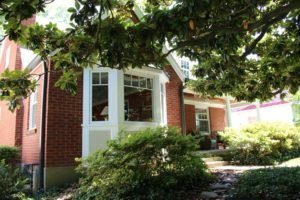 This St. Matthews bungalow needed new, energy efficient windows. Rather than settle with a look seen throughout the area, the homeowners – with Ann’s help – redesigned the look and the function. The original bay had a center picture window with a “4-over-4” light pattern, and was flanked by two double hung windows (raise/lower). Sometime during the life of this window, siding was added below the windows. Note that the roof on the bay is a typical shingle roof. Secondly, the homeowners changed the old double hung windows to casements. Casement windows are windows hinged on the side. 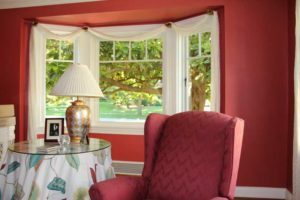 In this situation, the homeowners chose push-out casements instead of the typical crank style. 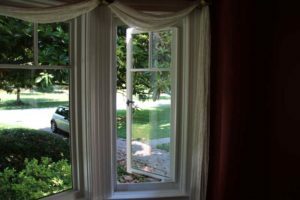 To open, they simply turn the window handle and push out the sash – an easy and old fashioned way to enjoy pleasant temperatures and breezes. To top it off, the homeowners added the high transparency retractable screens. These screens retract out of sight when not in use. The homeowners continued the update by removing the siding under the windows and returning the look to flat panel trim, then added a seamed metal roof. As you can see, the total look is stunning! We think this is a very successful exterior transformation! These windows are made by Marvin Windows and Doors and installed by the Door Store and Windows. 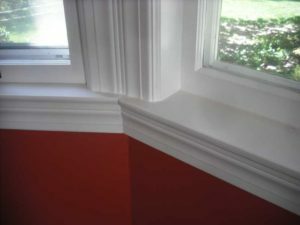 To see more about push-out casements, click here. Click here for more info on high transparency retractable screens.